You can make a good impression last when you flash a beautiful smile. But what if you do not have a perfect set of teeth? What if they are not perfect? What if they are not aligned or are overcrowded or crooked? There are just so many things that can cause you to feel ashamed of your smile and if you are one of those people who have these conditions, don’t worry because there are always dental solutions to your problems. Correcting and addressing problems concerning the alignment of your teeth is the main focus of orthodontics. This is the branch of dentistry that deals with the treatment of oral conditions specific to misaligned, overcrowded or crooked teeth as well as the jaws that are not in the proper position. Having these conditions can increase your risk of decay and cavities because you will not be able to perform a thorough cleaning in your mouth. Crooked teeth are also not pleasant to look at orthodontics can actually help you achieve a solution for this so you can enjoy a healthier and better looking teeth. Many orthodontic problems are a result of genetics. These are the ones that are inherited from parents or something that is already a history in your family. Examples of these conditions are crowding, spacing, protruding teeth, an extra tooth or jaw growth problems. However, there are also some orthodontic conditions that are just acquired because of repeatedly doing certain habits such as thumb sucking, or because of accidents, and late loss of baby teeth. If you are considering getting an orthodontic treatment, you have to consult your dentist and have yourself checked. Your dentist can help you decide whether the treatment is appropriate for you by doing a review on your dental and medical history, conducting a clinical exam, taking special X-rays as well as photographs. If you qualify for an orthodontic treatment, your dentist will be developing a treatment plan for you. Most of the time, orthodontic treatments are recommended for people with crowded or crooked teeth; people with underbite or overbite problems; and people with large gaps between their teeth because of missing teeth. There are a wide range of orthodontic dental services that you can actually take advantage of, but the treatment you will be getting will depend on your specific case. You and your dentist can have a discussion on the best treatment plan that will help you achieve your desired results. 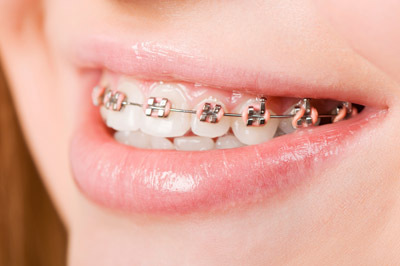 Braces are one of the most commonly used appliance under orthodontics. These are ideal in correcting an improper bite especially for children, plus it can restore the appearance and health of your teeth. If you have crooked teeth, you are more likely to get cavities and tooth decay because there may be some parts of your teeth which will be difficult to clean. If you get braces, you can get straighter teeth by the end of the treatment period. You also have to remember that when you are wearing braces, you should be providing extra care for your teeth because of the presence of metal brackets and wires which can easily trap foods. Also do not skip your regular dental visits to make sure you are still on top of your oral health even when undergoing orthodontic treatment. If you want to get a straighter teeth without having to deal with metals and wires, Invisalign can be the best solution for you. Invisalign is a set of clear aligner that works by gradually shifting your teeth to their proper positions. Similar to braces, a gentle pressure is being used to correct the position of your teeth, only that you are given a new set of aligners every 2 weeks. Compared to braces, Invisalign has a shorter treatment period as you can get your treatment done in just year or a little more than a year. Retainers are the ones that hold your teeth in place after you have worn your braces. These are important in making sure that your teeth do not move out of their position anymore.